Will you and your family be like the one who said thanks to Jesus or the nine that didn’t? Thursday is Thanksgiving day. This likely isn’t news to any of us. We have been planning for Thanksgiving for weeks. A menu is planned. Invites have been shared. Homes are decorated. Plans for the day are in place. 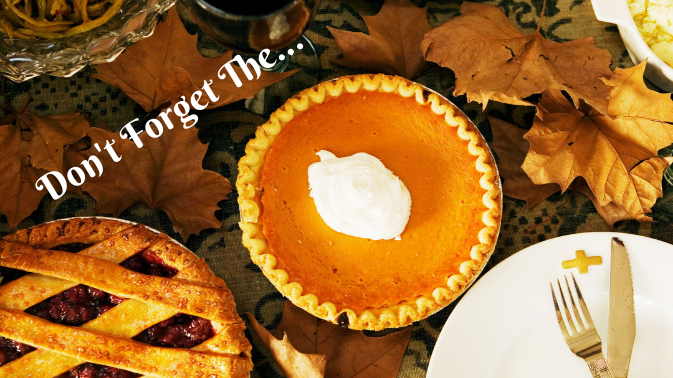 We plan for Thanksgiving because we want to create memories that last. We want to enjoy our families and experience meaningful moments around tables, TVs, and even standing in shopping lines. What if there was one thing that you could add to your day that would make it even more meaningful and special for everyone? In the Gospel of Luke 17:11-19, we are told a fascinating story of Jesus healing 10 men. These men weren’t blind or paralyzed like others that Jesus healed. These men had a disease, leprosy, that turned them into outcasts with little to now hope for the future. As Jesus was traveling, he crossed paths with these men. It would appear that these outcasts were actually seeking to meet with Jesus. When they saw Jesus, they called to Him from a distance. Their words, “Jesus, Master, have pity on us!” Jesus heard their cry and instructed them to go to show themselves to the priests. This didn’t make sense because the priests wouldn’t welcome them and couldn’t be near them, but as they were on their way, they were cleansed of leprosy. All ten were healed. At the command of Jesus, all ten were healed. How would they respond? What would they do? One man, when he saw that he was healed, came back to Jesus. One man, returned to praise God and say thanks to Jesus. All ten were healed, but only one said thanks. This wasn’t missed by Jesus. Hear his words, “Were not all ten cleansed? Where are the other nine?” Let that sink in: all ten were heald, but nine didn’t return to give thanks. Only one came back to Jesus. Jesus received his thanks and told him to get up because His faith had made him well. As we enter into Thanksgiving week, this story has some very tangible takeaways. First, most will celebrate Thanksgiving this week, but not everyone will say thanks to God. We may fill our day with food, family, football and even a little shopping, but none of this is as important or as impactful as giving thanks to God for all that He is doing and has done in our lives. Second, we see that giving thanks to God is a choice that requires action on our part. Simply enjoying your life isn’t enough. Say thanks to God. This thanks giving can be done personally through prayer and reflection. Take time to pray. It can also be done in groups and gatherings. Take time to discuss what God has done in the good and the bad parts of our life. Will you and your family be like the one who said thanks to Jesus or the nine that didn’t? This question isn’t meant to elicit guilt, but to clearly outline the challenge. If we don’t plan to say thanks even on Thanksgiving, we won’t. We will enjoy the blessings of God without giving Him credit for all that He has done. This year, add giving thanks to God to your Thanksgiving plan.